In the last post I have described how machine learning (ML) can be used to accelerate very computationally demanding nonadiabatic excited-state dynamics. This approach is rather universal and can be based on various ML algorithms such as kernel ridge regression used in my previous study. In the project led by Ganglong Cui in Beijing Normal University, we have shown that deep learning can also be applied for carrying out molecular nonadiabatic excited-state dynamics. The demonstration has been done by exploring topological structures of S0 and S1 surfaces, S1/S0 conical intersections, and the photoisomerization pathway of CH2NH. Deep learning model was trained on 90,000 points and reference calculations were performed at the CASSCF level of theory. One of the important goals of the project has been to run pure ML dynamics without invoking any reference calculations during the course of a trajectory. We demonstrated that this goal can be achieved by careful sampling of the points near the conical intersection and by including them into the training set of ML. Deep learning reproduced both energies and forces well and could properly describe the topological structures of both ground-state and excited-state surfaces. Crucially, deep learning could also correctly provide the structure and energy of the conical intersection, so that pure ML dynamics became possible. The results of the ML dynamics simulation based on hundreds of trajectories closely resembled results from the pure ab initio simulation. In particular, time-dependent S0 and S1 state populations, distribution of hopping points and products, as well S1−S0 energy gaps have been accurately reproduced. 1. 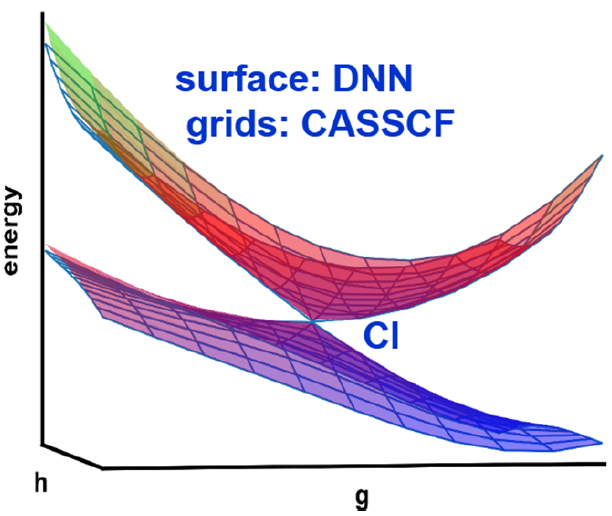 Wen-Kai Chen, Xiang-Yang Liu, Weihai Fang, Pavlo O. Dral, Ganglong Cui, Deep Learning for Nonadiabatic Excited-State Dynamics. J. Phys. Chem. Lett. 2018, 9, 6702–6708. DOI: 10.1021/acs.jpclett.8b03026.